Rodman presents the 31 Spirit Open. a hard top less version of this model launched a year ago in September 2010. Thanks to this configuration and the 31 Spirit Open moving circular aft settee, this model gives impressive space outdoors for a sport cruiser measuring just over nine meters. The catch here is that with the open version one looses the convertible double berth coming from the L-shaped settee on the main deck, and an all year sun or rain possible usage. But if you are planning a more day use or cruise as a small family and mostly in Summer this should suit just as well ones needs, as below decks there is still accommodation for three berths in two areas, and a separate shower head. 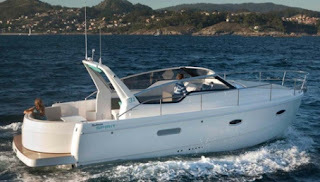 Power for the Fulvio De Simoni designed Rodman 31 Spirit Open is from a single or twin 220hp, with various engine choices in between.